Four suspects—three under police custody, the other still at large—were charged yesterday with murder and frustrated murder after the shooting inside a fastfood outlet in Barangay Tabunok, Talisay City last week. The Cebu City Traffic Operations Management (Citom) yesterday acquired a new towing truck that will enable them to continue its operation of towing illegally-parked vehicles in national roads and city streets. Mandaue City experienced heavy traffic yesterday after a 10-wheeler Isuzu truck collided with six other vehicles at the corner of H. Abellana Street. CEBU HEADLINES. 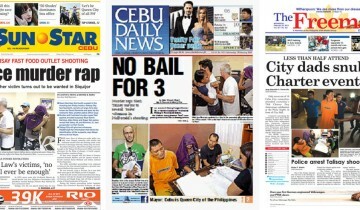 Today’s front pages of Cebu’s three English dailies. Talisay residents Ricci Edwin Ramirez, Allan Velos and Roger Cal and Dexci Gomilao, were charged with the death of German national Heinrich Haffner and the injuries caused to French national Julian Maillard and Indian national Cheten Saparaiya who were customers at a fastfood outlets in Talisay City. Police filed charges of murder, two counts of frustrated murder, and illegal possession of firearms against Ramirez, Veloz, and Cal. No bail was recommended for three arrested suspects. Gomilao remains at large. Police are still trying to get the full identity of a fifth suspect, known only as “Macmac”. In yesterday’s proceedings, a previous case against Maillard also surfaced. He was arrested, using a warrant, for a case filed three years ago by his Filipina ex-wife in Siquijor for alleged violations of Republic Act 9262, or the Violence against Women and Children Act. Since 2014, Citom has been using clamps to seize vehicles illegally parked on the roads and streets. With a new towing truck that costs the City P5 million, the traffic agency will pursue a massive operation of towing illegally-parked vehicles along roads, sidewalks and barangay access roads. Doing this will ensure public safety since illegally-parked vehicles are an obstruction to the passage of emergency vehicles in times of crisis or urgencies, Citom said. An Isuzu truck owned by Cenapro, Inc. that is based in Jagobiao, Mandaue City was driven by company driver Gerardo Pepito, 52, towards Mandaue City proper. Due to a malfunctioned braking system, the truck hit a Toyota Revo Wagon then another Isuzu truck still owned by Cenapro, Inc. at the corner of H. Abellana Street, Barangay Canduman and Basak National Highway. It happened at 8:30 a.m.
Pepito’s truck moved forward to hit a multicab that was carrying six persons, including the driver. The multicab hit the second Cenapro truck and another Isuzu van that hit the rear portion of another Isuzu van. The injured were brought to Mandaue City Hospital and Chong Hua Hospital in Cebu City. Pepito will be charged with reckless imprudence resulting in multiple physical injuries and damage to properties. He is currently under police custody. The Freeman: Less than half of Cebu City councilors attend Charter Day event, was it a snub?